New York City is one of the most populous cities in the United States and forms the center of the New York Metropolitan Area which is one of the most populated metropolitan areas in the world. New York City is a global center for commerce, finance, media, art, fashion, research, technology, education, and entertainment. It is the home of the United Nations and Wall Street. The city is located on one of the world's largest natural harbors and is divided into five boroughs: The Bronx, Brooklyn, Manhattan, Queens, and Staten Island. 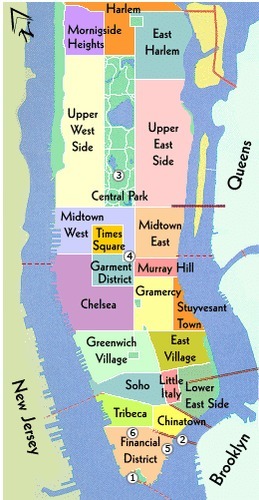 Many of the districts and locations in New York City are internationally known landmarks and locales. Times Square and the Broadway theater district are major centers of entertainment; Manhattan's real estate market is among the most expensive in the world. Brooklyn Brooklyn is the most populous of New York City's five boroughs, with approximately 2.5 million residents, and the second-largest in area. Manhattan Manhattan is the oldest and the most densely populated of the five boroughs of New York City. Home to Times Square, the Empire State Building, Rockefeller Center and Central Park. Queens Queens is the easternmost of the five boroughs of New York City and the largest in area and the second-largest in population. It's home to the two major NYC airports — LaGuardia and JFK. Staten Island Located in the southwest part of the city. Staten Island is connected to Brooklyn via the Verrazano-Narrows Bridge. 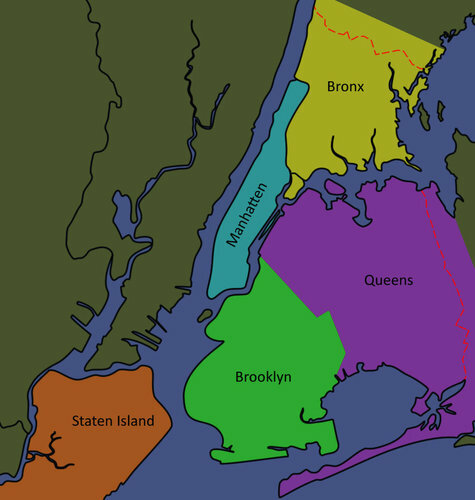 Map of New York City Boroughs.